My mantra for 2018 was balance. 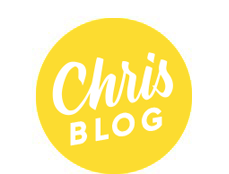 After a hectic previous year, I made a goal to focus on work/life balance, which is always a struggle for freelancers. While I am very satisfied with (and grateful for) the work accomplished this year, I am most proud of my commitment to self-care throughout the process. As in previous years (2011, 2012, 2013, 2014, 2015, 2016, 2017), here is my annual recap of how my year unfolded. January started at a slower pace, allowing time to get the studio in order. I received my Communication Arts award in the mail, which was such an honour. (Turns out, it's really heavy!) You might know that I am obsessed with daytimers and calendars, so I released a new perpetual wall calendar - it makes planning out the year fun and easy. Biggest news of the year: I started taking tap dancing lessons! In February, I participated in City of Craft's Made for Love Valentine's Day pop-up at the Workroom. I also had lettering work featured in Today's Parent magazine (yay for daydrinking!) I also had some downtime to start researching sign painting at the Toronto Archives. In March, I was invited to offer hand-lettered cards and prints at She Matters, a fundraising brunch in support of the Barbra Schlifer Commemorative Clinic, which offers legal representation, professional counselling and multilingual interpretation to women who have experienced violence. I also shared some new custom lettering work for President's Choice + Sid Lee. New hand-lettering also got full page coverage in the West End Phoenix. As the days started to get longer, April brought a new feature on chromatic type in UPPERCASE Magazine. Warmer temperatures also allowed me to do some window painting: Craig's Cookies (my first in One Shot enamel paint!) and The Theatre Centre. I also completed a huge custom chalkboard for Boxcar Social. And what a pleasant surprise: my article on custom signs feature in the May/June/July issue of Cottage Life magazine! In May, I completed some hand-painted signage for Will O'Hare's photography show (part of the Contact Photography Festival), as well as a huge custom chalkboard for a real estate staging. Spring was in the air, so a new custom sign for Sweet Gale Gardens. I also completed a fun Pollock-inspired mural for Craig's Cookies. And the tapping continued! After five months of research, I started a new project in June called #chrispaintssigns, using traditional sign painting techniques to explore letterform proportions. As we prepared for our latest instalment of Pixel & Bristle at the Drake Hotel, I launched a new series called Dishonest Signs. 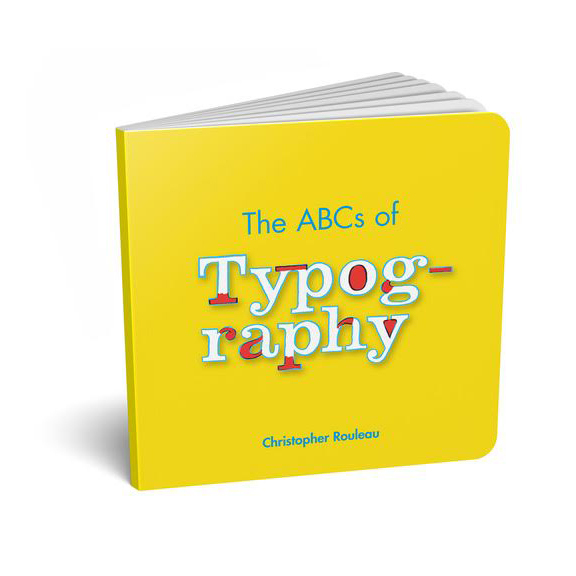 Also, my ABC250 monograph turned one! I was away in Italy (!) for most of August, but did have time to prep something for the TypeCon silent auction, which happened in Portland. Part of October was spent visiting family in Saskatchewan. I also prepared some graphics for my favourite wartime gal, Pearle Harbour. In November, I partnered up with Wonder Pens to offer a special brush lettering workshop at their new Clinton Street store. Along with two special pieces for the Buddies Art Attack auction, I released some new work for the holidays, including an alphabet print, a GLOW-IN-THE-DARK Toronto signs print, and some coupon-inspired holidays cards. A couple of these prints were featured in the annual Swash & Serif typography show. And I also shared some new explosive lettering on pimple popping (!) for Chatelaine Magazine. And then suddenly, it was December! Another round of Pixel & Bristle at the Drake Hotel, plus my first studio sale, and a pop-up at Gloria Cafe. I snuck in one more launch: a new ABC book published my the Harvest Commission. A quick custom window for Type Books. But my favourite and most meaningful project of the year: a special typographic portrait to celebrate the 80th birthday of Roberta, gifted from her four children: David, Jenny, Rebekah and Heidi. 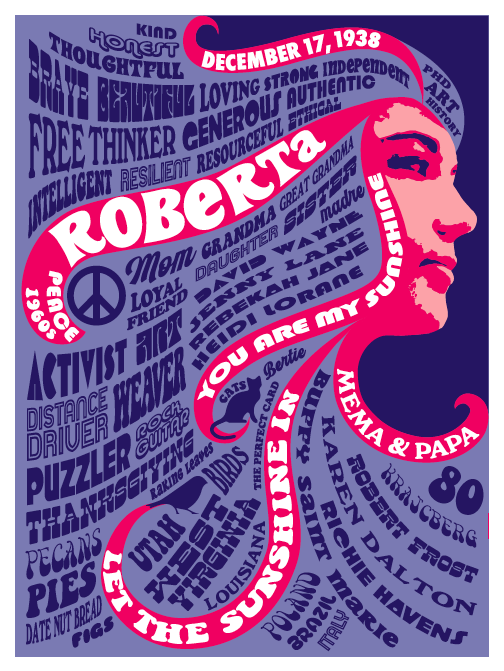 The piece is comprised of over sixty individually typeset words, names, phrases, places, artists, songs and events that have filled Roberta’s rich life. This year would not have been possible without the support of YOU – those who purchased a print from my shop, liked one of my Instagram photos, or visited my studio. I am grateful to continue doing work that I love. THANK YOU!